For all of these we've just used regular plain old sugar cookie dough. 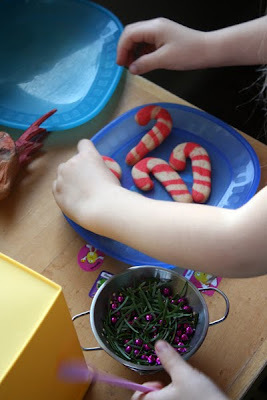 The kids love how it tastes, and it's an easy type of dough for them to work with rolling and cutting, plus it's pretty pale in colour, so you can play with food colouring with it easily. 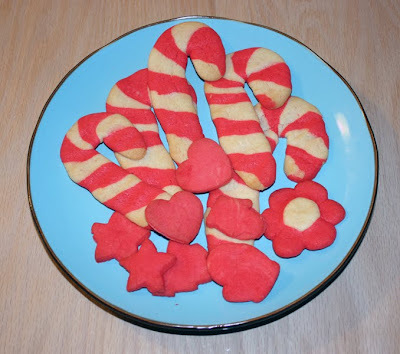 This time I wanted to try and make Christmas cookies that didn't require icing. 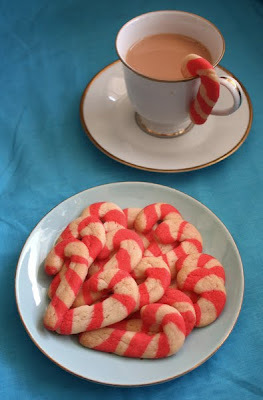 I like to be able to dip my cookies (although I call them biscuits) in my tea, and icing is no good for that, plus it's a hassle to whip egg whites and all that guff to make royal icing. 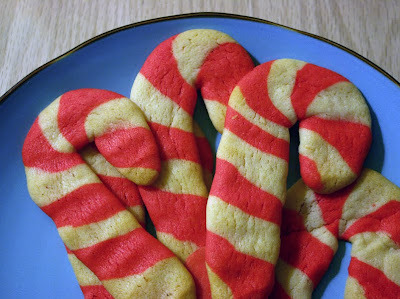 The answer I decided was to make a batch of sugar cookie dough that was half red and half plain, so we could make candy canes. 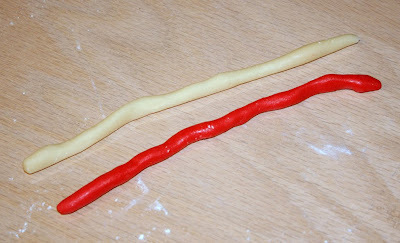 Roll out a bit of red and a bit of white into long snakes. Then twist them up and roll them a bit more. 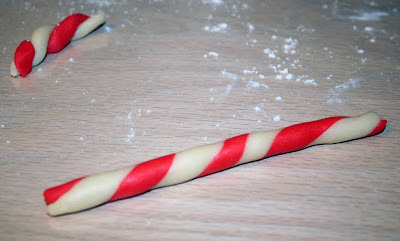 plonk on a baking sheet and curve over the top into a candy cane shape and squish it down a little to make it flatter. 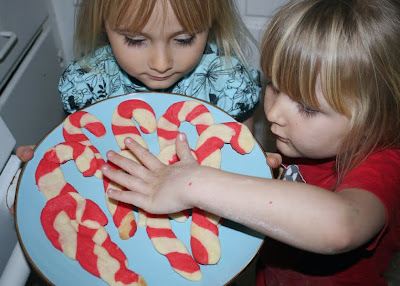 Bake happily and see if you can manage to get a picture of your children with them before they inhale them. Oh look, the second batch out of the oven I was actually able to get near to to take a pic before they were nommed! We only did half the batch of dough with the kids, so there was more for me to play with after they had gone to bed. 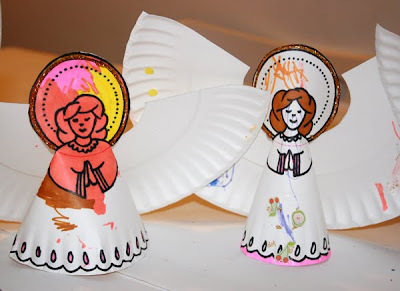 I decided to make dinky little ones that could be hooked on the edge of a cup of tea. 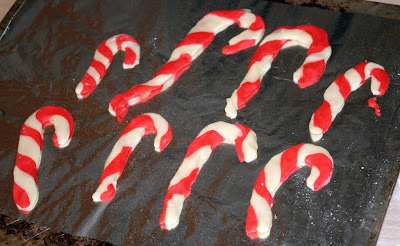 I'd seen this post about making cute mini gingerbread houses at "Not Martha" and knew that I didn't have the dedication to cut out all those pieces and make icing and stick them together, so a candy cane seemed like the easy option, and just the right shape to hang too. The kids scarfed them before they had a chance to hang on anything. By the way, I have been informed by my children that the collinder full of shredded christmas tree and snipped up mardi gras beads is "reindeer food". So, if you find sparkly poop on your lawn on Christmas day, you know you scored a hit on Santa's good list. 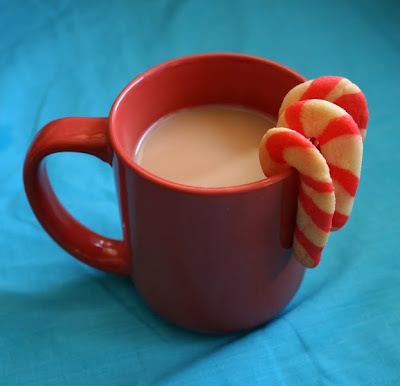 So, if you want to drink your tea in a lady like festive way then give it a go. We just got our tree yesterday. 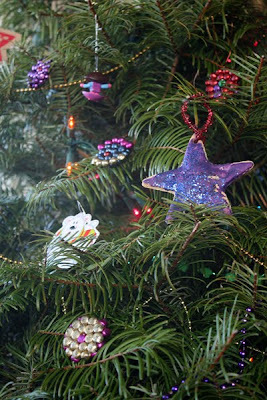 Very exciting for the kids indeed, because we've never had a proper Christmas tree in the house. Mainly due to being jetlagged squatters in the UK over Christmas, and last year we just got a teeny potted tree that was a foot tall. This year, we went for the main event though. Nice 4ft tree that we could decorate. Hooray! 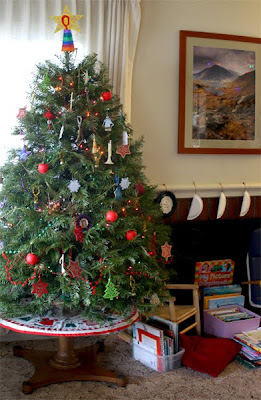 I was a bit concerned that we might not get a tree this year again, because a week or so ago my five year old had a little story to write that started "Imagine you are a little Christmas tree in the forrest. One day some men in a truck come along and cut you down. What happens to you next?" Well, her response totally took me off guard. When I asked "What happened to you after the guys cut you down?" She just looked at me with this half disgusted and half incredulous expression and said matter of factly "I died." As if to say "Mum, they cut me down, what else did you think would happen?!" We went for a more festive rewrite after a bit of a talk, but I wasn't sure how she would feel about having a dying tree in our livingroom for the holidays. I'm bracing myself for some seriously nutty fruitarian teenage years. Turns out it was going to be ok, so we went to get our tree. 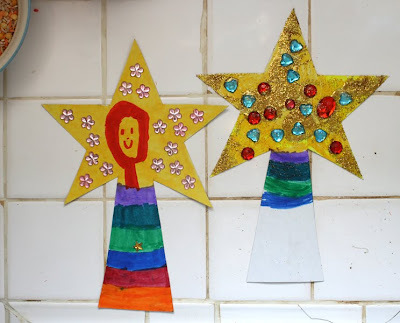 The kids really wanted to make a star to go on top, so I cut out two cardboard stars and gave them one each to colour in and decorate with glitter and glue on jewels. 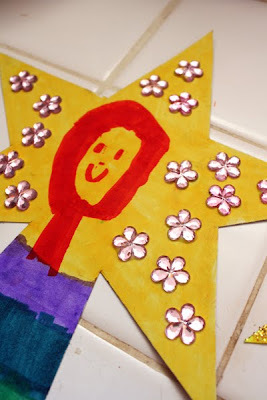 My five year old surprised me by turning her star into a sort of angel, which was very cute, because I love love love kid's drawings. 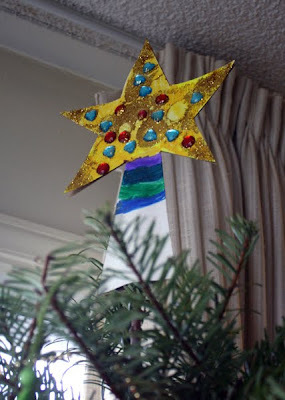 My three year old was determined to copy most of what her sister was doing, down to the colours of the stripes on the cone that was going to support the star. 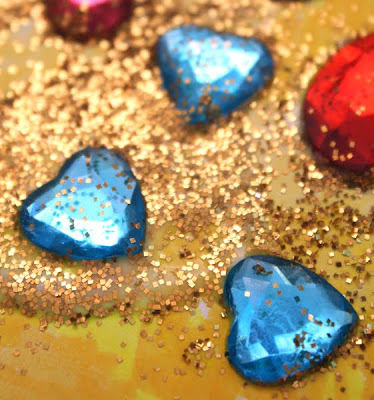 Here's a nice close up of the glitter for those of you that are glitterphobes. Mwah ha haaaa! Yes, it was all over the place. 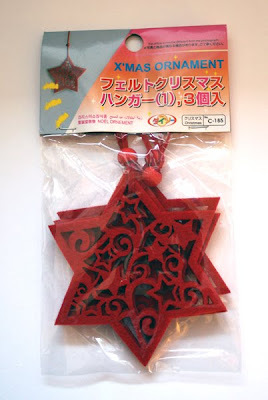 When the stars were dry I hot glued around the edges of the star and cone to hold them back to back, and then we could slot it over the top of the tree, so that the point of the tree went all the way up into the point of the star and it was held securely. 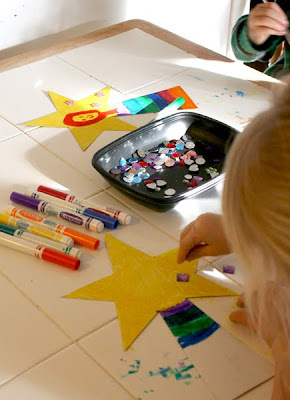 Preschooler ettiquette is such that we must rotate the star each day so that everyone has a turn for their artwork to be at the front. 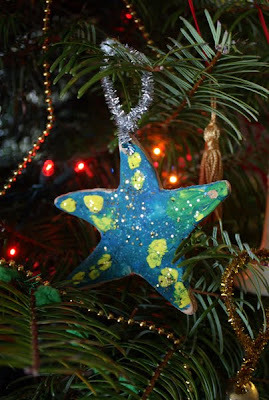 I might go for a tradition of getting them to decorate a new star each year and keep them all because I am a sappy sentimental mum and they will store flat. 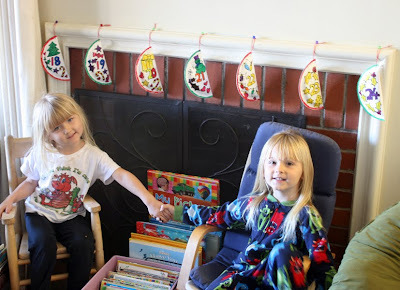 As far as other decorations for the tree went, we had a load of mardigras beads that my friend Courtney had sent my kids last year. We draped some of those over the tree. 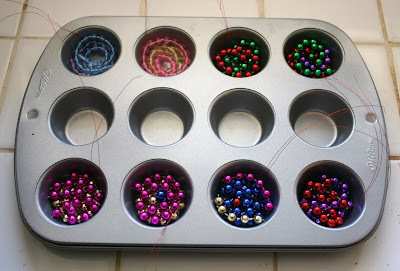 Courtney suggested cutting up and melting some in muffin tins to make ornaments to hang, so I gave that a go. 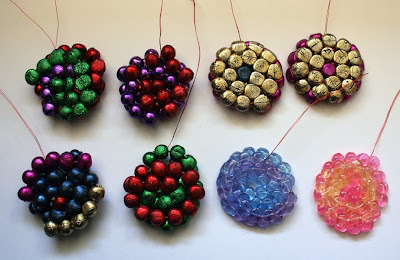 The kids snipped up the beads and I cut up and tied on some magnet wire to hang them by. Regular string worked too, but the magnet wire was nice and hidden on the tree, without being something that would burn or melt in the oven. 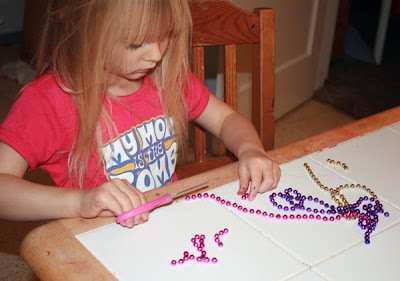 Most of the beads we had were the metallic looking type, which are black plastic spray painted, so when they heated up, the paint cracked, but they still stayed shiney. I thought that we might just end up with black circles, so I only melted them at 350F for about 10 minutes, then whipped them out and squashed them as flat as I could with a metal spoon. 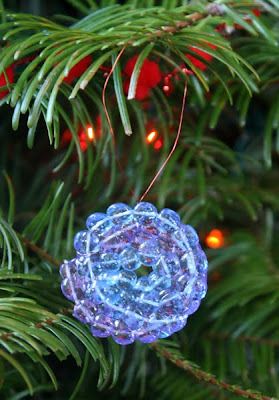 The few transparent coloured plastic beads that we had made much more beautiful ornaments, because they melted better, and the lights on the tree could shine through them. Very pretty! 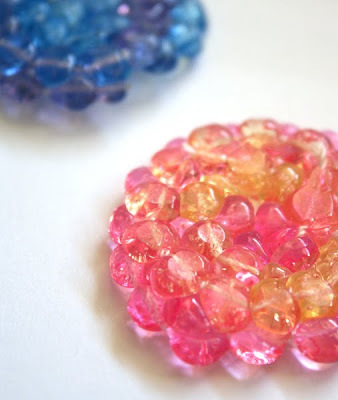 We had the fan on and the window open to melt these beads, because I wasn't sure what kind of stink the melting plastic would make. it wasn't that stinky though, I guess because we only barely melted them. 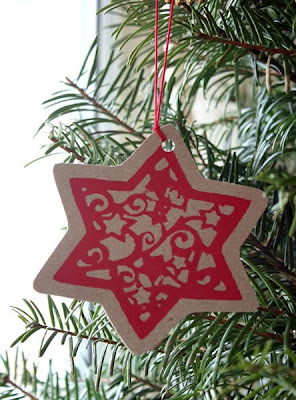 Other decorations on the tree include some of the gift tags that we printed the other day. Some of a set of 50 dollar store gift tags. 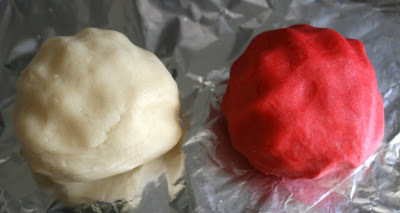 Salt dough ornaments from last year. Instructions here. We need to make more of these, because the kids really enjoy it. We also hung some of the apples from the kid's play food on there. I think they were supposed to be ornaments anyway. I asked the kids if they wanted to hang any of their little model animals on the tree, but apparently that was a silly suggestion and no one except me is into the idea of a zoo tree. 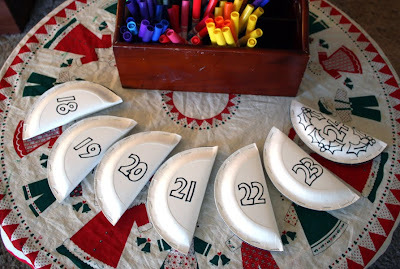 We never got our act together early enough to make advent calendars for the whole month of December, even though I still have last year's and all I'd have to do is cut and glue more tissue paper over the cups. Total slackers! So I figured we'd just wait until a week before Christmas to have a count down calendar. 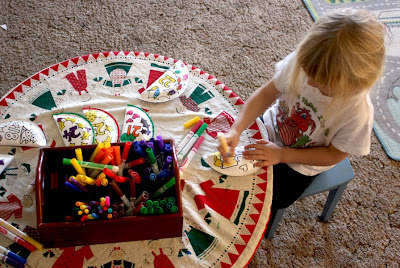 At least this way the frenzy is compressed, and with schools out either yesterday or today around here, it makes a nice post school count down, because for most kids the holiday season starts in truth when winter break kicks off. I had a few random sweets and little cheap toy things that I'd collected and with them being all different shapes and sizes it wasn't going to be easy to find containers that would fit them all, so I decided to make sort of calzone from paper plates to put them in. I popped the treats in the plate, folded it over and stapled it shut. 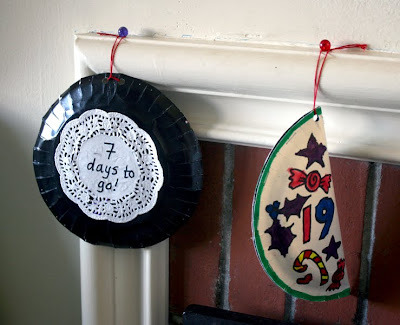 I drew the number for the date on it with a sharpie and when all seven were done, I set the kids to work colouring them. I left all but the 24th blank so that they could draw thier own pictures on them, but they demanded that I draw and they colour, so we ended up with lots of random christmassy stuff coloured in on them. 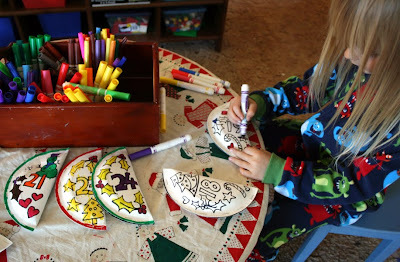 The good thing about using paper plates rather than just circles of paper was that the lip of the plate made a nice space inside to fit treats, and they were sturdy enough that the kids could colour on them without squashing the treats hidden inside. 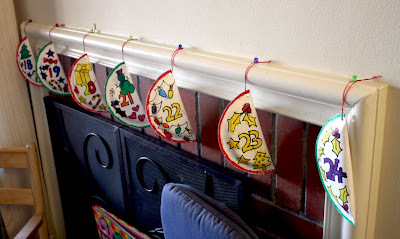 I hole punched a corner of each and threaded string to hang them, then banged some tacks into the fireplace. The kids hung them up in the correct order. Yes, that's a green snowman you can see there. Hey, at least it's not a yellow one. We openned the one for the 18th and the kids nommed the treat inside. 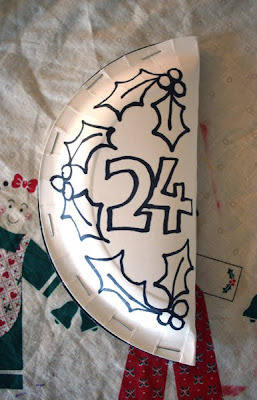 Now you can see that I stuck a wee paper doily on the inside of the plate and wrote on it "7 more days to go". This way they have a little reference hanging there, and the openned pate looks kind of pretty still hanging there like a snowflake. I only had little black plates, but if you had green and red plates it would look very Christmassy. 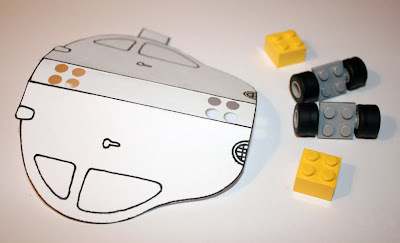 For any of you missing the LEGO posts, there is a DUPLO themed post from my partner in crime, er, I mean parenting, over on his blog, Fangletronics. 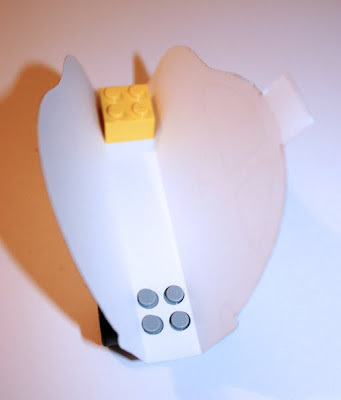 He's hacked together a very sweet little traffic light for the kids to use with thier toy cars, and it fits neatly into a little DUPLO brick housing. 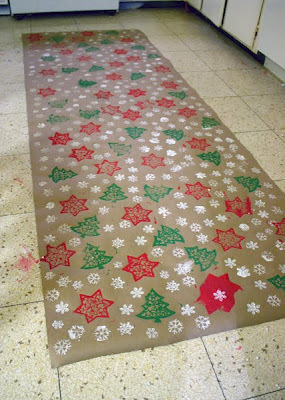 Ages ago we made some wrapping paper with foam stickers and a rolling pin. 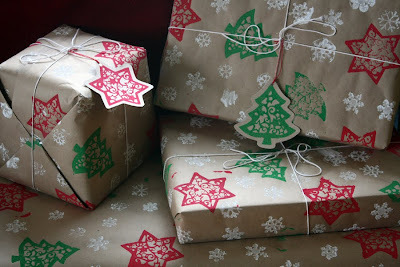 The drawing robots from ages ago made pretty cool wrapping paper too. Anyway, I only had five foam snowflake stickers left over from the advent calendars that we made last year though, so we weren't going to be able to use that rolling pin technique this year unless I went out and bought more. Instead I figured the kids would have fun just stamping them one at a time, especially if I made a couple of really big stamps. 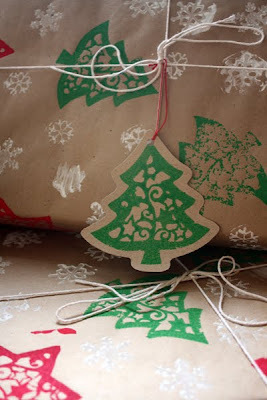 This post is more about how I made the stamps than the finished wrapping paper, because I know a lot of people have blogged about stamping wrapping paper in other places around the interwebs. old polystyrene. I'll post about some other cool stuff that we're been able to make with this little tool at some point. Can you tell how excited I am to have it? 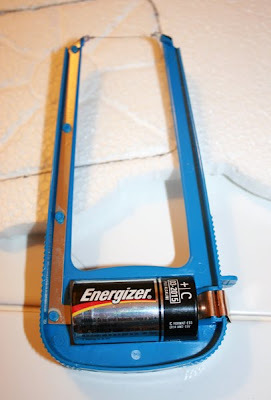 Hubbins was all geared up to make me a foam cutter from guitar wire and a model railway transformer, but no need! So I stuck the foam stickers onto the polystyrene sheet and then cut around them with the foam cutter to make little stampers. You could stick them on anything though, bottle lids would work pretty well too. 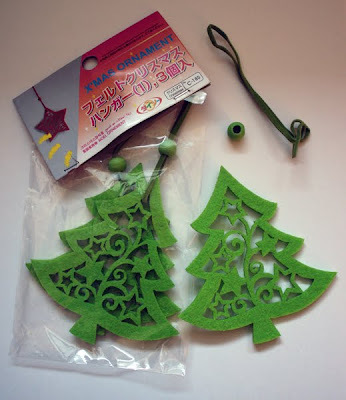 The big stamps I made using some laser cut felt tree ornaments that I also found in Daiso. They were $1.50 for a pack of three trees or three stars. 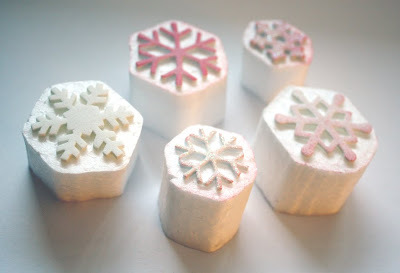 I liked the idea of using these as stamps, because the felt would soak up the paint well. I've seen packs of flowers and hearts made from laser cut felt in the Dollar Tree before now. 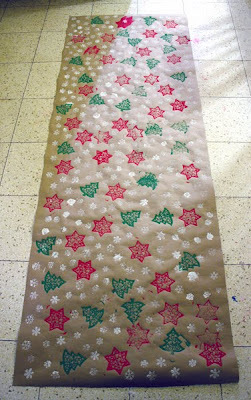 They were a little bigger and would be great for making valentine or birthday wrapping paper with! 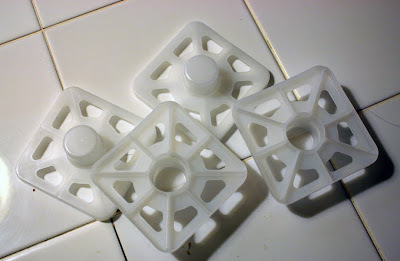 Anyhoo, the other component that worked rather well for making these stampers were the plastic ends from rolls of catering foil that we got from Costco. The smaller rolls of foil don't have these supporting end pieces, but the heavier duty foil that comes in the whopping rolls does, and I'd saved them thinking, "cor they are an interesting shape. I wonder what they will be handy for." 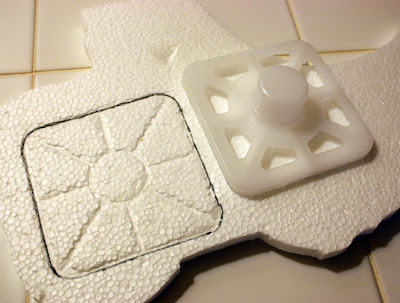 I pushed the plastic ends into the foil to mark the shape to cut out with the foam cutter, then hot glued the foam shape into the plastic thingummydoodle. 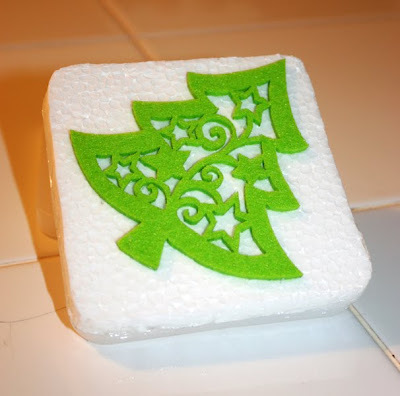 Then I just took off the hanging thread and bead from the ornaments and hot glued them to the foam. Voila! 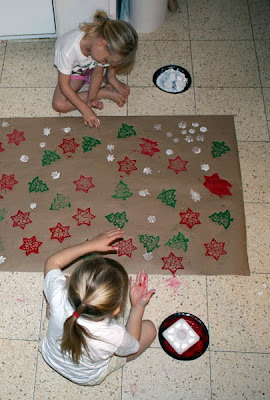 Giant Christmassy stamps for the kids. 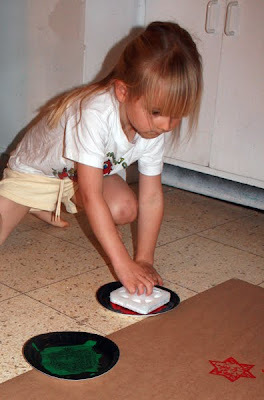 Big bit of brown paper, paper plates with kiddy paint, and off we go. They did a pretty darn good job! 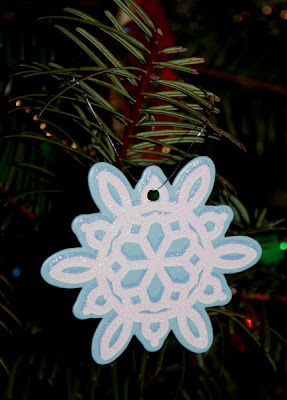 The felt stampers worked way better than the foam snowflake ones, but it was good to have the snowflakes, because the kids went around filling in spaces with them. They could get about four stamps out of the felt stampers before they had to reload them with paint. 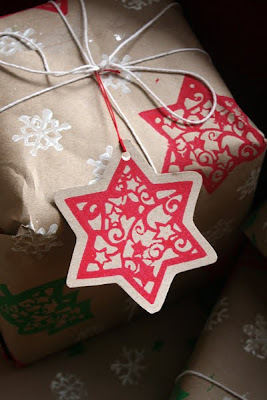 Later that evening I got a sheet of brown cardboard that we'd got from between the rolls of kitchen paper at Costco, and stamped some more trees and stars to use as gift tags with the wrapping paper. here's the finished stuff. Looks pretty tidy for being done by a five and a three year old! 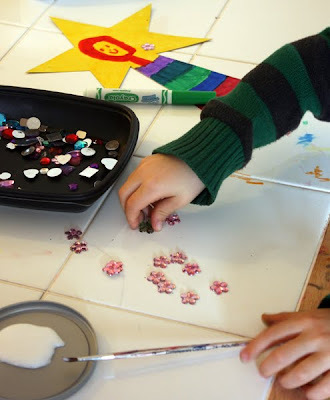 We'll definitely be making more with the Dollar Tree felt hearts and flowers! I'm sure you can find appropriate bits and bobs in your recycling bin if you don't have access to the plastic ends from the catering foil. 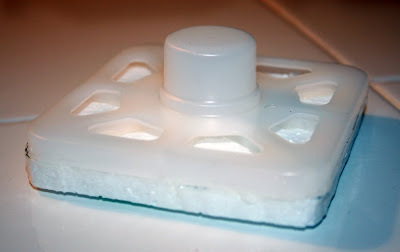 a big mayo jar lid with a smaller lid glued to the back of it? 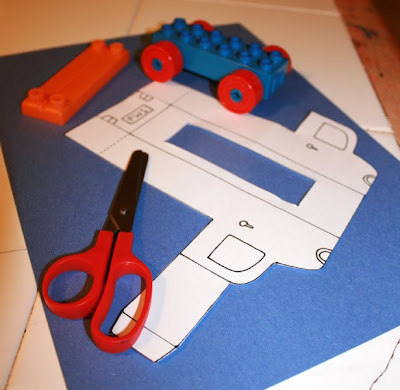 We could even try it with regular craft felt cut into shapes. 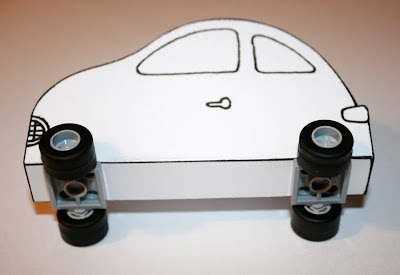 It's thinner than the laser cut stuff, but I reckon it would still work. There's no way I could cut out anything that detailed from it though. 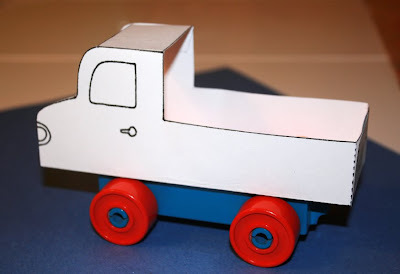 Maybe simple shapes like a bubble car and a truck that you can draw little windows and wheels on with a sharpie when it was dry? 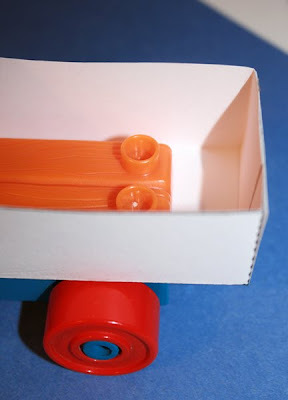 So, you can buy the small LEGO wheels at the LEGO store by weight. We got one of the smallest tubs a while back. I think it was $7.99 and you could easily get 30 or more wheels in there. Anyhoo, here's the thumbnail that links to the full resolution image for printing. 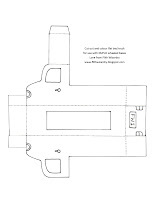 It prints on US letter sized paper and you just need a regular hole punch to make it work. 4 cars to a page. 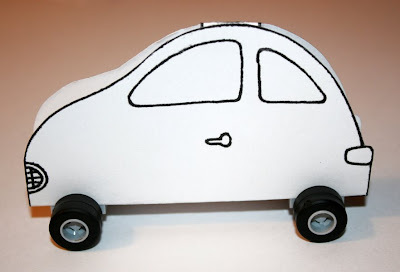 Cut out your car, punch the holes and let the kids decorate them, then glue the tag to keep it closed. 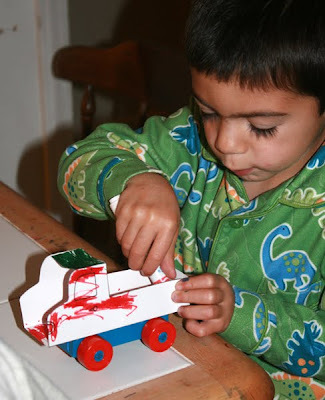 I left the ends open for simplicity and also so that the kids can easily take the wheels on and off themselves. This one you don't even need a hole punch for, because you just cut out a rectangle for the wheeled base to fit through. It's more likely that a grown up is going to have to cut and fold this one, but I made the design still simple, so the kids could decorate easily. 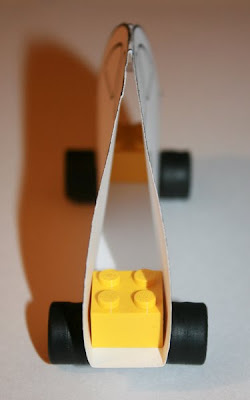 I modified the print out from the one that you see in the pictures, so that there was a flap to fold up and glue at the front of the truck as well as the back. 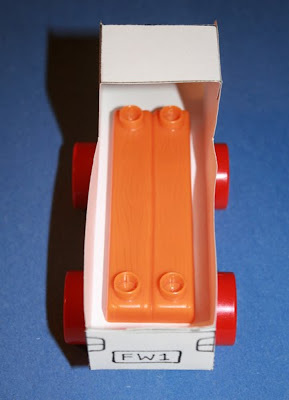 We were lucky that we had this perfect little lego bit from a Dora set to use as the flat bed base, but any DUPLO would fit over the top fine. 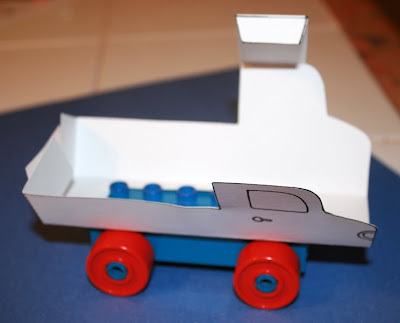 As with the car template, the idea is pretty darn simple, so you could modify this to make a fire truck or a big rig or anything you fancy very easily. 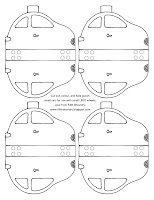 If people are interested and I do make other templates over time then I can scan them and pop them on the blog if you like. Here's the thumbnail link to the template. US letter size paper again. Hopefully that isn't going to be so wide that it crops off on A4 paper. Let me know if that's a problem and I'll fix another template for people printing with A4. Have fun and do let us know if you make your own versions. I'd love to link to them!